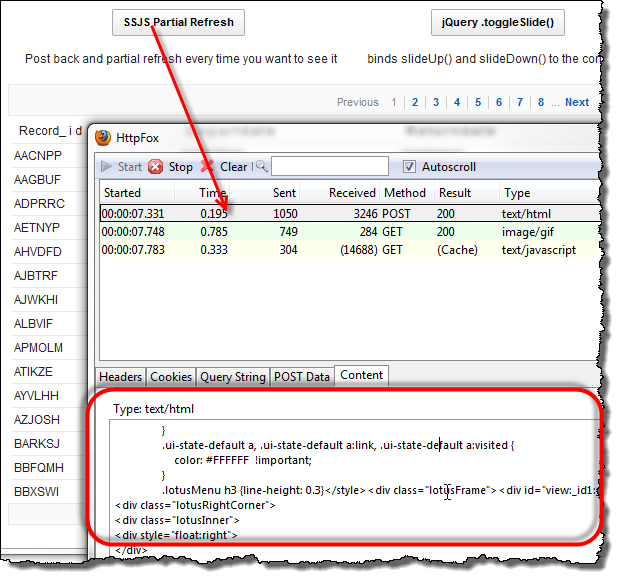 In this article I will demonstrate how the jQuery .slideToggle() method can create a better user experience within your XPage *and* makes your code easier to maintain than using SSJS to achieve the same goal. Many use cases require information to be hidden from a user depending on the current state of the web form they are working on. Upon the desired trigger, more information is made available to them. This is a simple demonstration on how to make a better user experience and also reduce your code. 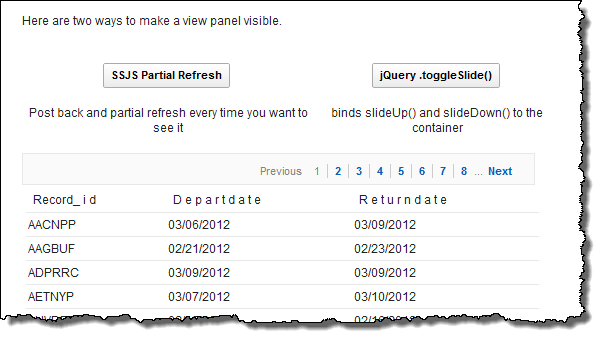 In this case I have demonstrated how to show and hide a viewPanel. When displayed all the normal pager functionality continues to work and both examples maintain the state of the pager. This would very simply animate the expansion of the section and when it was clicked again it would animate the collapse of the section. This is really nice because we do not have to programmatically track the state of the display. To do the same thing in SSJS we have to track the state of the display. I do this by adding an attribute to the div programmatically and tracking a viewScope variable. This is also 8.5.3 code only because I need to add an attribute to the xp:div. You also have to consider there is a round trip to the server every time an SSJS button is clicked which on a slow connection can be detrimental to the user experience. Even in this simplistic example you can see that there is more code to maintain in the SSJS version and advantages to using the jQuery version. jQuery can make both your user experience and your maintainability easier when used judiciously.